This vanity is a great way to add traditional style to your bathroom. The white marble counter and brown plywood base make this piece great for any bathroom. The double-door cabinet and drawers are great for putting away bathroom items. This simple vanity set from Bellaterra will fit right into any bathroom decor. With a modern look and strong design, this vanity will help any bathroom look nicer. With a white artificial stone counter and white fiberboard base, this product is good-looking and useful. With drawers and double-door cabinet, this vanity set is also great to keep items in. Redo the style of your bathroom with this classic from Wyndham Collection. Add this vanity to your bathroom for more modern style in your home. Made with a special white fiberboard base and a white artificial stone counter, this piece will make your bathroom look even nicer. With a double-door cabinet and drawers, this vanity can hold all kinds of bathroom items. Put a classic feel in your bathroom with this good-looking set from Wyndham Collection. 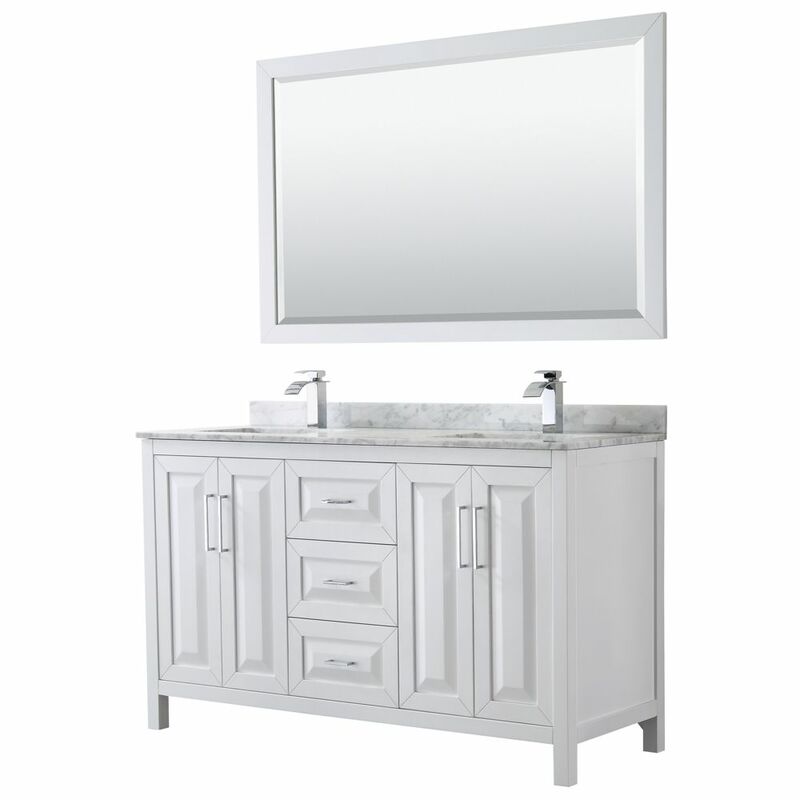 Daria 60 inch Double Vanity in White, White Carrara Marble Top, Square Sinks, 58 inch Mirror The beautiful Daria collection vanities stand out in any bathroom with strong, clean lines, raised panels and elegant counters with square sinks. There's plenty of cabinet space, the fully extending drawers are dovetail construction, and chrome detailing completes the look. Daria vanities deftly combine the function of today with a nod to the elegance of the past. It's the new modern classic styling with a contemporary twist.